Fiberglass Stepladders are made of a non-conductive fiberglass industrial material. They are extra-heavy duty, capable of supporting 300 lbs. 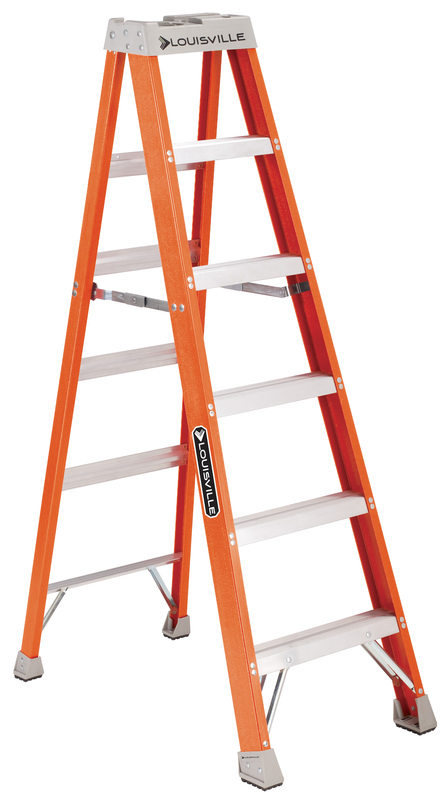 These ladders are equipped with slip resistant footing and a non-conductive structural molded top with tool slots to help keep tools close at hand. ER-FBSL-4 4 19-9/16" 3" 28-15/16"
ER-FBSL-5 5 21-1/16" 3" 34-7/8"
ER-FBSL-6 6 22-9/16" 3" 40-7/8"
ER-FBSL-7 7 24-1/16" 3" 43-13/16"
ER-FBSL-8 8 25-9/16" 3" 52-3/4"
ER-FBSL-12 12 31-9/16" 3" 76-1/8"